Without a thriving workplace culture, organizations may suffer from employee disengagement, stagnant business practices, uninspired products and services, and decreased financial performance. An important component of building a thriving culture – and improving the bottom line – is creating the conditions in which employee well-being can also thrive. 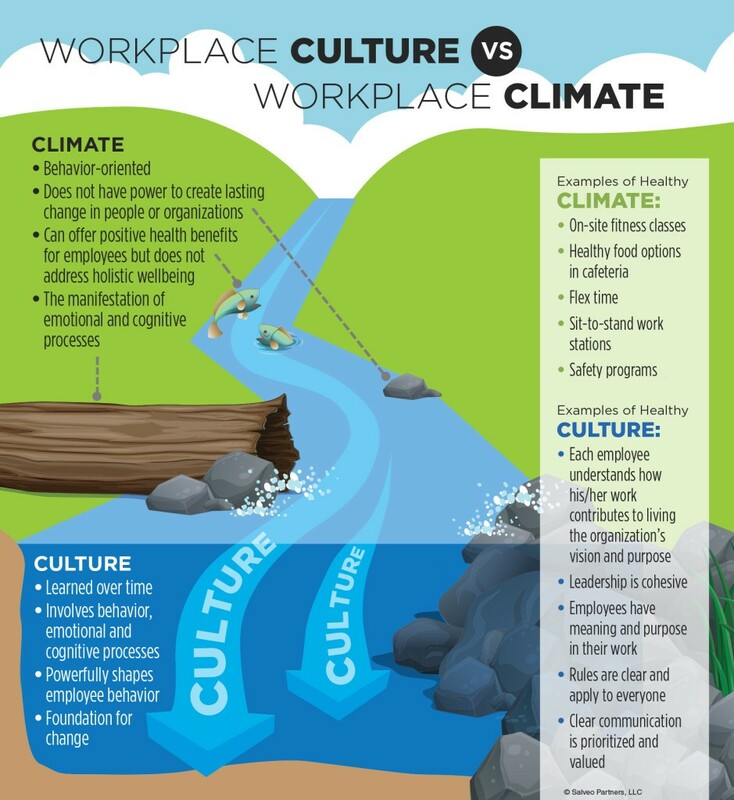 A clear understanding of the difference between culture and climate is essential to effectively align both and create the conditions where the organization and employees can thrive. The distinction can be visualized through the analogy of a river. Everything you see on the surface – the flow of the water, the shape of the riverbed – is climate. Climate itself is a manifestation of the underlying, ever-changing, yet powerful current: Culture. Many workplaces offer options like wellness programs, flex-time, and maternity or paternity leave. While these may offer some benefits for employees, these “climate changes” do not necessarily foster meaningful personal growth and development. 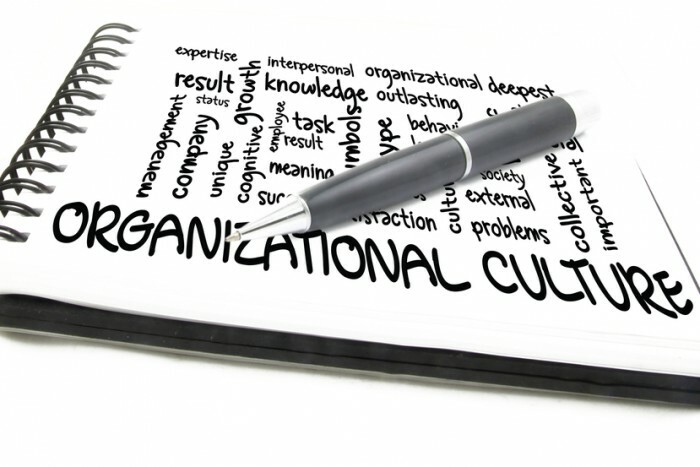 In fact, if the underlying organizational culture is unhealthy, these programs won’t improve the health of employees or your organization in the long term. Implementing strategies, goals, and policies without addressing the underlying cultural assumptions can also be misleading. Reflecting on his brief tenure as the president of a manufacturing company, culture guru Tim Kuppler revealed that strategies he used to transform the company from an authoritarian to a shared-learning environment did have some success. However, most of the improvements were climate changes, which concealed some of the deeper cultural problems that still needed to be addressed. Understand how their work contributes to the organization’s mission and purpose. Feel valued for everything they bring to the table, not just for their ability to complete tasks. What are the two or three behavioral traits that lie at the heart of your organization’s identity? Core values shouldn’t be confused with what Patrick Lencioni calls permission-to-play values like “honesty” or “integrity,” which don’t uniquely define you. One of the best ways to identify your core values is examining traits that are inherent to your organization, and evaluating the qualities of the employees who already embody what is best about the organization. Once you’ve clarified your core values, involve employees in living them on a daily basis. Offer workshops on Culture and Visioning and Workplace Culture. People support what they help create, so provide employees the opportunity to describe what the workplace looks like when everyone is living the core values. What behaviors will they see that are consistent with core values? What behaviors might sabotage them? Consider offering additional quarterly workshops for employees to reflect on how well people are actually living out the core values. With this foundation, employees can begin creating their development path, which will support the need for meaningful work. Use core values as a universal litmus test. Because leaders profoundly shape employees’ experience of the culture, every leader and manager within your organization needs to live the core values and create the conditions where employees feel valued in all situations, from hiring to recognition and even firing. Deliberately scheduling play. Organizations that are already doing this recognize that adopting a childlike mindset opens people up to alternative ways of thinking. Although play can include physical activities (e.g., a Ping-Pong table in the break room), it is really more of a mindset. The key is for employees to feel safe pursuing occasional tangential interests. Creating an environment that positions people to do their best work. Some people need quiet space to allow for focus and concentration, while others benefit from collaboration. Create spaces that allow people to work well, but also to play and relax. Consider repurposing a meeting room into relaxation space for reflection, meditation or short naps. Supporting breaks and vacations. In his book, The Best Place to Work, author Ron Friedman asserts that the human biological need for rest is as strong as the need for food and water. Yet personal time – including vacations – has become infected with work. Some simple things you can do to support the human need for rest include leaving time between meetings, encouraging employees to take a quick walk, and providing time for socialization. Or you can put your money where your mouth is and pay your employees to take a vacation, like the progressive software company FullContact! People want to work for organizations that truly value them as thinking, evolving, and complex-systems capable, not just as cogs in the company machine. Help your employees take advantage of developmental opportunities. Whether they choose courses or conferences to enhance professional skills, or programs or coaching to help them grow personally (a cornerstone of highly effective organizations), employees who are supported to grow are much more likely to be engaged at work. Organizations that provide a clear mission and vision, offer meaningful work, and actively seek ways to help people integrate their personal and professional lives will reap the benefits of retaining energized employees who are equipped to bring their best selves to work each day. How does your organization support employee well-being? What do you consider your organization’s most important cultural characteristics? Rosie Ward, Ph.D., is an accomplished and sought-after expert, speaker, writer, and consultant on workplace culture, organizational development and employee wellbeing. She leverages these principles to help organizations develop and implement strategies to create a thriving workplace culture that values and supports wellbeing and the unique, intrinsic needs of employees.